Our range of products include pallet wheels. 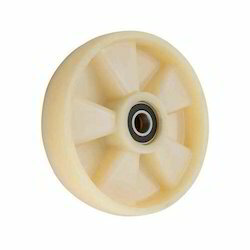 We manufacture and export our huge range of nylon pallet wheels at great prices and fast delivery. These are made for lighter duty use and nylon is rigid so that no wear and tear is possible for longer period of time. Nylon pallet wheel are available with bearing option 6205. Looking for Nylon Pallet Wheels ?